In each reaction, neutrons are released with the multiplication of three and this reaction is continuously running until original nuclei are fission. A single fission reaction generates a large amount of energy, so the complete nuclear chain reaction process will generate many times greater energy. Though all neutrons are not used nuclear chain reaction. Some of these neutrons are lost to the surroundings. If this reaction is not controlled, it will produce explosive violence’s. The working principle of atom bomb blasting is an uncontrolled nuclear chain reaction process. This reaction was discovered by Hahn and Strassmann in the year 1939. Generally Uranium-235 is used for nuclear Fission Process.It is a fissionable material and also it is used all modern nuclear reactors . In the above picture, a heavy atomic nucleus uranium-235 is bombarded with single neutrons and produces two nuclei. First uranium will be an unstable ‘compound nucleus’ to absorb neutrons. The radioactive atom of any nucleus is unstable for continuous emission of an alpha() or bita() particles. This will change the proton-neutron composition of the nucleus to built a stable nucleus. 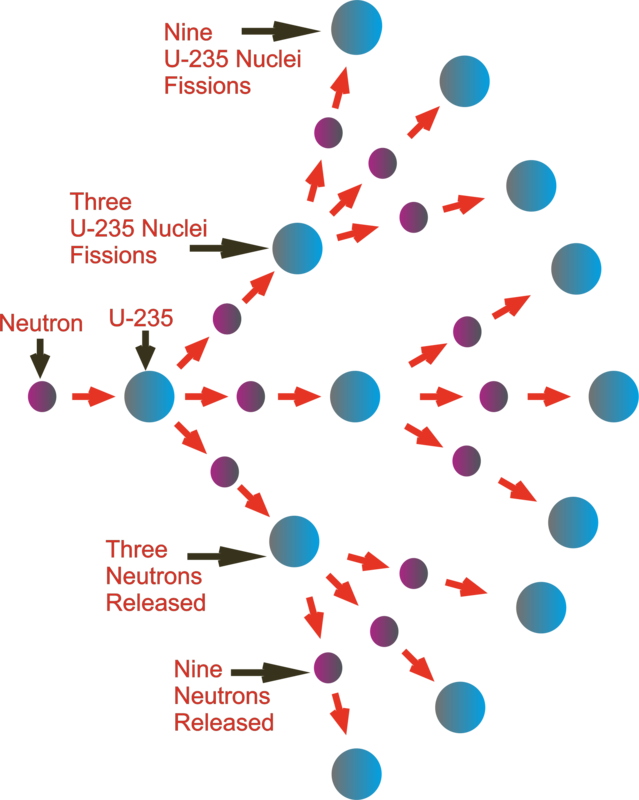 U-235 will be an unstable nucleus when it absorbs a neutron. This unstable nucleus will be split into two daughter nuclei (i.e. 23592U and 9436Kr) with some neutrons and release a large amount of energy. It is seen that one fission reaction of 23592U release nearly 200 MeV of energy.